Photo courtesy of Roberta Berg Peach. Jet is a type of fossilized driftwood (similar to coal), hard and black or very dark brown in color found principally in Yorkshire, England, but also in Spain, France's Aude region, Germany and other parts of northern Europe, Asia, and North America. 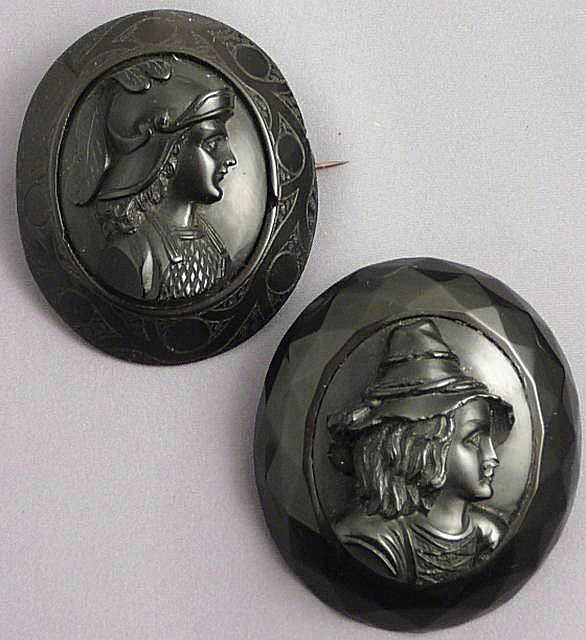 It is often referenced as Whitby jet in finished jewelry since many souvenir and mourning pieces made of this substance were carved and sold in this English town at its peak of popularity. The pliable nature of the material made it capable of being carved, faceted and polished to a soft warm sheen. Most pieces found today are indeed highly polished. However, jet jewelry intended for first mourning, the months just after a loved one's passing, was often made with a matte black appearance. Beads and other necklace components strung or linked together with wire were made of jet as were numerous brooches and pendants carved entirely of this material. While used for jewelry by the ancient Romans, and sporadically in Europe thereafter, jet flourished in the 19th century as one of the few substances considered appropriate for mourning jewelry (though it was worn outside of mourning too). The use declined after 1875, supplanted by cheaper options such as black onyx (chalcedony), black tourmaline, black glass ("French jet") and vulcanite. Dwindling supplies of quality material, preferences for more delicate pieces - though light, jet jewelry tends to be large and massive-looking - and less rigid mourning-dress practices around the turn of the 20th century also contributed to a loss of interest in jet. Jet will be opaque black in appearance and will not have mold lines, so the first test is to inspect it visually. It was also hand carved so no two pieces will be identical. Most jet was highly polished, but pieces made for first mourning will be matte black. Natural jet will be very light in weight in comparison to French jet, which is actually black glass. It will also be room temperature rather than cold like glass. It's also interesting to note that jet will not scratch glass, but glass will indeed scratch jet. Touched by a hot pin (very carefully and in an inconspicuous place to avoid damaging the jewelry being tested), Lisa Stockhammer of www.georgianjewelry.com noted, "it may smell earthy or coal-like" - since it is indeed a type of coal. A less risky method of testing: take the piece in question and scrape an inconspicuous area on a rough surface like the back of a ceramic tile or the bottom of a piece of unglazed porcelain. If it leaves a brown mark, the piece is likely jet (although vulcanite can also leave a brown mark, so be sure to look for other jet attributes before making that call). Note: While the hot pin test will result in the smell of burning coal, this test is not usually recommended. Depending on the substance being tested, you could ruin the piece at the very least and some plastics like celluloid are highly flammable making the hot pin test dangerous to administer. Was All Black Victorian Jewelry Meant for Mourning?